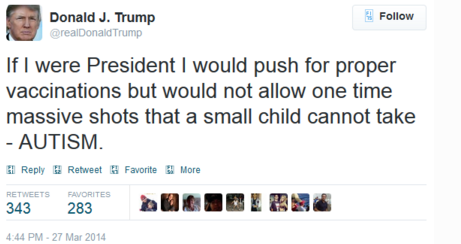 Home » News » Donald Trump: Vaccines Cause Autism..
Donald Trump has publicly spoken out about the dangers of vaccinations, and has said he believes that vaccines cause autism. “I’ve gotten to be pretty familiar with the subject,” Trump went on to say. 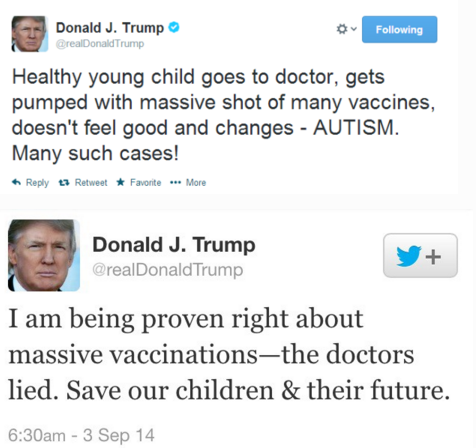 “You know, I have a theory — and it’s a theory that some people believe in — and that’s the vaccinations. We never had anything like this. This is now an epidemic. It’s way, way up over the past 10 years. It’s way up over the past two years.